6ft Trampoline with weather cover and ladder. 8ft Trampoline with weather cover and ladder. 10ft Trampoline with weather cover and ladder. 12ft Trampoline with weather cover and ladder. 13ft Trampoline with weather cover and ladder. 14ft Trampoline with weather cover and ladder. 15ft Trampoline with weather cover and ladder. 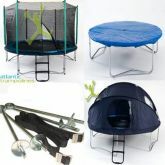 The highest quality trampolines in a full range of sizes fit for children and adults of all ages! All the trampolines below come complete with a ladder and weather cover ensuring easy access and all year round protection. 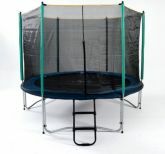 We recommend an enclosure to go with your trampoline in order to keep you and your children safe at all time. Feel free to give us a call on 0800 032 5879 for expert advice on any questions you may have.